We interrupt our Latin American reporting to bring faithful followers a practical Partout about how we find the weather we want and where we find it. As anyone who knows us knows, our travels are highly weather-driven. Louis suffers in the cold, Doris wilts in humidity. In retirement, we have solved the heat issue permanently by summering in Sandpoint, where we never experience extremes of heat, humidity or mosquitos. Winter, however, is the annual question. In Latin America this year, we have done a bang-up job of avoiding winter’s cold, damp and darkness. It has not always been thus. Sure, a house on the beach like the one above, where we spent a week in Zanzibar last winter, meets Louis’s requirements, but a steady stream of these locations would turn Doris into a molten mess. And, yes, southern Europe is significantly warmer than northern Europe, but how much sunshine does a winter’s day bring? How much rain? And is even southern Europe “warm enough” for cold-averse Louis? Southern Spain in late fall 2017: Definitely not warm enough. To improve on our active imaginations and flawed impressions, we go data diving. Fellow weather wimps, this Partout is for you. Weather-and-Climate.com (WAC) is where we start. First, we click on the country under investigation. Let’s take a look at Ecuador, since that’s where Partout plans to spend most next winter. Here is what Ecuador’s country page displayed this March 31. Most of this is about as helpful for weather mapping as a horoscope is for life mapping. Only by clicking on the little “city” link do we get the real weather gold. For example, we are currently planning to spend most of next winter in Cuenca, Ecuador, passing through Mexico City for a couple weeks either on the way there or back. The temperatures in both cities are mild and stable all winter (i.e., both are “warm enough”) so the question then becomes whether there are other weather conditions that make it smarter to go to one city earlier in the winter than to the other one. To find out, we scroll down to the annual sunshine charts for the cities, where the plot thickens quickly. The top chart under this paragraph is for Mexico City, the bottom one for Quito (the nearest comparable city to Cuenca). March turns out to be Mexico City’s sunniest month, with an average of more than 250 hours of bright stuff. December is still sunny, with just under 250 hours on average. Meanwhile, down at the equator in Quito, March is close to the most overcast month of the year, with a little less than 150 hours of average sunshine. Things brighten up considerably for Quito in December, when the average is almost 200 hours. Comparatively, this means we could experience three hours more sunshine a day in Mexico City in March than we could expect in Quito. Mexico City would still outshine Quito in December but by a great deal less. With this, our itinerary lurches toward heading straight to Quito/Cuenca in December, returning via Mexico City in March. But there’s still another variable that can make a huge difference in travel pleasure: Rain. Another big wow awaits in the weather data. Again, Mexico City in the top graph, Quito below. Turns out Mexico is bone dry in both December and March, but March is Quito’s second-wettest month of the whole year. By the metrics most important to us, starting our winter in Ecuador and ending it in Mexico begins to make a whole lot of weather sense. There is just one hitch. Quito is not our final destination, Cuenca is, and Cuenca is nearly 300 miles south and 1,000 feet lower than Quito. Sadly, WAC has failed us on Cuenca. The site uses weather data from Guayaquil for Cuenca, but Guayaquil is a famously humid beach city whose weather is nothing like Andean Cuenca. We chose Quito for comparison purposes because we know its weather patterns are much closer to Cuenca’s. Still, a lot of important detail can get lost in “for comparison purposes.” The average height of Louis de Guise and Lebron James is 6 feet 2 inches, but that does not give us a very good picture of what the two guys look like. A deeper dive is required. For that data, we turn to a mobile device and open our go-to weather forecasting app: Dark Sky. Let’s switch continents for this exercise. Our most urgent weather-planning need this very minute is not winter in Ecuador or Mexico City but spring in Marseille, France, where April takes us. WAC reports Marseille’s average high temp at a smidge under 60 F for the whole month, but what does that mean in terms of packing for a visit that will stretch from the end of March to the beginning of May? This is where Dark Sky’s Time Machine – and being really, really data wonky – comes in. The Dark Sky forecast for April 17, roughly the midpoint of our visit to Marseille, is for a high of 64 F (four degrees warmer than the historic average). But if we time travel back to the same date in 2018 with Dark Sky, we find the high was 76F – more than 10 degrees warmer than this April’s forecast and 15 degrees higher than WAC’s historic April average. Taking another leap in time to check out 2017 on the same date, we find the temperature not quite as warm as in 2018 but still much higher than the WAC average. We pack with all this in mind. What’s more, historical weather data appears to be getting less reliable. Everywhere we go, whoever we talk to – whether it is the last ice merchant of Cotopaxi, an indigenous guide in the Amazon or an Uber driver in Bogota – tells us their weather is not what it once was, their temperatures are hotter, their seasons dryer. In the end, all the research under the sun will not unerringly predict what any given sunrise will bring. We choose mild temperatures under sunny and dry skies. Doing the data dive to improve the odds of getting them is like searching for the most desirable flight schedule or air fare. It pays off. Mexico in March 2019. Definitely warm enough. Whether your reaction to our weather plotting is “This is the best news since sliced bread” or “Get a life!” we could not travel as happily as we do if we left weather entirely to luck. Having located the websites most relevant to our weather goals, useful data is never more than a few clicks away. We also continue to rely on real, live breathing humans for weather insights, especially those humans with preferences and goals similar to our own. Two inches of rain falling between 10 pm and 4 am daily have a vastly different impact on travel comfort and activity than two inches falling between 10 am and 4 pm. Sometimes it takes someone on the ground to turn the averages and histories into useful guidance. Whatever it is that makes your travels happiest, seek out the internet and human resources that best report on what matters most to you on the road. The most robust source in the world is worthless if it doesn’t lead to the results you want. If the US political environment (or, in our binational family, the Brexit debacle) is getting you down, here is some consolation: At least you do not live in Ecuador. Partout had the uncertain fortune of arriving in this small South American country in the midst of the campaign lustrum for electing (or re-electing, if not term-limited) every city councilman, mayor, county supervisor/commissioner, public works director and, perhaps, dogcatcher in the whole country. This added up to 80,281 local, provincial, cantonal and parochial candidates from 279 political parties campaigning all at once, everywhere. Based on what we saw and heard while there, it felt like many many more. Ignoring these local elections (as Americans routinely do) is not an option. Every Ecuadorian from 18-65 is required by law to vote. Scofflaws who do not exercise their suffrage are subject to fines equal to 10% of the nation’s minimum guaranteed salary for one month and become ineligible for public services such as education and health care. Ignoring office-seekers is not an option either because, as we witnessed, they are inescapable, 24/7, for the duration of the campaign season. We could not vote, but we also could not escape. From all appearances, campaigning for local office in Ecuador goes something like this. Pick an office to run for, preferably the one most likely to line your pockets with bribes, kickbacks and other time-honored forms of graft. Come up with a catchy slogan, preferably something that emphasizes your honesty because the populace is desperate for some honesty. “Public Works Without Corruption” was one of our personal favorites, as if public works without corruption is a groundbreaking concept. Make about 20,000 colorful posters of your face and slogan (perhaps with a slate of fellow faces from your party) and splash them on every plasterable square inch of your community. When public spaces run short, rent surfaces from the owners of fences and homes. Flatness is not a requirement. Even trees will do. Arrow points to campaign sign in tree, even further from metropolis. Perhaps the cows vote? Strictly adhere to the rule that more noise = more votes. Buy, borrow or steal the most ear-shattering amplifiers you can, mount them to a car or truck and recruit your brother, brother-in-law, barber or whoever else stands to gain from your gain to drive up and down every block of your community day and night blasting your name and slogan in hopes of impressing everyone within earshot that you really, truly are the honest candidate. Augment mobile blasting with occasional rallies, preferably shutting down Main Street (“Calle Simon Bolivar”) in the process to demonstrate your ability to get things done. If already flush with cash (perhaps because you are already an office-holder? ), rent a stadium or other venue and hold an event that can be heard for a mile in every direction or until every eligible voter within earshot promises you have their vote. A rally in the village outside this church all but drowned out the Mass celebration. Perhaps these worshipers were asking God for deliverance? We were not in a position to determine whether these tactics are augmented with relentless radio and TV commercials or robocalls, but every person we talked to in any language and of whatever political persuasion assured us the process produces almost nothing but crooks and promise-breakers. The consistent response when we protested, “Surely some of them are honest people intent on doing good work?” was that not more than 1 in 3 candidates might fall in either of those categories. There seems to be some hope the ratio is rising. The explosion of parties and candidacies in the 2019 election, the highest in the nation’s history, was viewed by some observers as a sign of political vitality and recuperation. Meanwhile, the populace remains in “hope and pray” territory. Yes, that was all pretty much the bright side of Ecuadorian politics. Political stability and rectitude are just plain not Ecuador’s long suit. The country may have avoided the political cataclysms of some Latin American countries, but it went through eight presidents from 1997 to 2010, including a five-day period when it went through three. The nation’s immediate past president has been charged in absentia with kidnapping, and his predecessor has been convicted in absentia for embezzlement. Both are on the lam. The country’s approach to term limits illustrates the dysfunction. By law, local officials used to be elected for a maximum of six years (1978-1984), then for four years (1984-2009), then for five years (from 2009-2019, thus the 25-cent word at the top of the blog referring to “lustrum” elections). Beginning with this election, terms have been limited back to four years in order to synch them with general elections. Voters like this gentle soul with the local campaign stickers on his living room window has to keep track of all the election laws along with the candidates. Good luck with that. Similarly, reelection has been variably permitted and banned, variably for local officials and the president. Most recently, a two-term limit for every elected office was enacted in 2018 after being banned in 2015. We heard about the looting repeatedly because it led to a devastating exodus of Ecuadorian youth whose parents were wiped out by the banker-swindlers. Almost overnight, something like 15% of the nation’s population decamped for other nations where they could find jobs and incomes to send home. Any 30-something we met who spoke fluent English was likely to have a personal story like our Quito tour guide’s (caption above). All told, some 2.5 million adolescents and young adults fled the country – something along the order of the entire city of Chicago disappearing from the population of Illinois. Today, about half of the expatriates are back, both their families and the nation’s economy sufficiently restored they can go home, at last. Some went beyond merely sustaining their families with remittances to build modern new family homes called “emigrant houses” because they were built with money sent back by the diaspora. Voters went to Ecuador’s polls March 24. In the name of “calm elections,” campaign noise-making was banned nationwide beginning two days earlier “in order to allow for a time of reflection and definition to those who will vote.” Relief, at last! A suspension of alcohol sales took effect at the same time. Violators were to be fined half the monthly minimum wage in the country ($193). Dismal and toxic as the US political scene may feel right now, absurd as the Brexit tragicomedy may be, Ecuador reminded us that things can be worse – and are, for untold millions worldwide, every single day. Also on the bright side: We are told the candidates, by law, have to remove, paint over and otherwise obliterate all traces of their campaigns within a fixed period after the election or be fined. Stay tuned for further reports from Ecuador next winter on whether this actually happens. We have a confession: We no longer try to live out of carry-on bags. We check bags, early and often. Now, we recognize there are friends among our faithful followers whose reaction to this confession is, “DUH! Who carries on everything anyway?! ?” Well, among road warriors living for extended time out of luggage, carrying on is a badge of experience and self-discipline. To which we say – bah, humbug. If you travel for as many months as we do at a time, there are products you need that exceed the liquid carry-on limits (e.g., sunscreen, insect repellent, maybe speciality cosmetics, etc.) and that are either outrageously expensive or unattainable overseas. We have evolved a system in which Louis carries on his roller-bag (which also provides a convenient trolley for his backpack), and Doris checks a somewhat bigger bag (too big for an overhead) that holds all her belongings plus Louis’s big stuff (shoes) and all our big liquids (sometimes known to include unopened alcohol). If lost baggage was the problem it once was, that would be one thing. It is not. Statistically, it is not and, personally, we have found it is not. In perhaps 30 flights in the last 18 months, every checked bag has arrived with us, in a timely fashion, with all our belongings still inside. We all grow up with images of the rainforest. Whether we got them from Tarzan, Tintin or Rudyard Kipling, Harrison Ford going mad on the mosquito coast or dog-eared National Geographics from our childhoods, the tropical rainforest – like the great plains of Africa – is woven so deeply into literature, film and news that it seems easy to picture. And then, if we are lucky or determined, we get there one day, and the deep jungle of the tropics turns out to be something else altogether. At least that is what happened to Partout after we flew 40 minutes from Quito to Coca, clambered into a motorized canoe, zipped down the Napo River for nearly two hours, trudged almost a mile through bogs to a shallow creek, boarded a canoe, were paddled to and across a lake and finally arrived at our digs, an eco-lodge in a rainforest preserve deep in the Amazonian jungle of Ecuador. We were armed with insect repellent, sunscreen and a lifetime of images that prepared us to be swarmed by butterflies (on the light side) or consumed by piranhas (on the dark one), all while running the risk of being squeezed to death by an anaconda or snapped in two by a cayman. Despite its namesake rain, the rainforest turned out to be surprisingly free of mosquitos, and sunscreen was never needed on the jungle floor, where light rarely penetrates. In our imaginations, the Amazon was full of peril – man-eating fish, lethal snakes, frogs that could kill us on contact. In reality, our guides told us, caymans mostly just lay in the mud with their big mouths open, waiting for a fish to swim in. As for swarms, the only ones that materialized were ants (army and angry leaf cutters). In the end, the Amazon jungle felt much more benign to us humans than the African savannah. On safari in Africa, idiots who step out of their touring cars can and do become breakfast up the food chain. In the deep jungle of Ecuador, humans are pretty much at the top of the chain; it is the small things that live in constant danger. In fact, perhaps the greatest surprise of the deep jungle was that wildlife is mostly small, even microscopic, and seldom dense in numbers. “What is rare is common and what is common is rare” is how our naturalist guide put it. The rainforest might be full of tarantulas but, in four nights, we saw just one. At the same time, Ecuador’s basin is home to more than 600 bird species, yet we could trek an hour or more through the tangle without spotting a single feather. It turns out lush is not the same as fertile. The rainforest is extravagantly, wildly lush. The vegetation can so dense it might as well be pitch dark for all the likelihood we could have found our way out. There is good reason the history of South American exploration includes a long trail of adventurer footprints that went into the deep and never emerged. But lush does not necessarily nurture. The soil is thin, the predators many and the competition for survival ferocious, fostering mind-boggling adaptations. Trees grow thorns and “walk,” changing ground over time, to protect themselves. Birds build nests around wasp nests to recruit armed guards for their young, termites build fake nests to fake out predators, cicadas lay eggs in what looks like spit to make the offspring look unappetizing. There is no orchid-blossom season, our naturalist told us, because no orchid wants to bloom when all the others are blooming; doing so would just reduce the chance of attracting a pollinator. One wily orchid produces blossoms that look so much like bees that bees have been known try to mate them. In search of nutrients, trees grow surface roots that snake so far from their trunks we could not see the ends of them. On the African savannah, it is wildlife that is elephantine – big game, finite in number even when abundant and all the varieties reasonably recognizable; plant life is relatively sparse. In the Amazonian rainforest, it is the trees, plants and mushrooms that rule, along with the insects that live off them. Kapok trees may tower like redwoods and strangler vines do hug trees to death, but bigger is not necessarily better in the battle for resources. Ultimately, the jungle is a Lilliputian cosmos teeming with finger-sized life so infinite in variety that new species are still being identified every day. Without the hawk eyes of our guides, we would have missed or mistaken just about every wild thing we passed. We sure would not have recognized the cordyseps that thrives by a zombie alchemy in which it invades the body of its prey and transforms it into mold. In the end, the rainforest turned out to be a sensory feast where vision took the back seat to sensation and sound. Bird calls, of course, but also the 6 pm cicada whose chirp as sunset approaches is the time clock of jungle life, howler monkeys with cries like motors, frogs that bark, rainfall as loud as thunder. And, often, gliding through ancient creeks in a dawn fog, utter and complete silence. As for Tarzan. . . . That swinging-on-the-vine thing? More Hollywood. A native might shimmy up one to get bearings if lost in the forest, we were told, but only if there was no better option. A typical vine might not bear the weight of a child, much less the archetypal ape man. The childhood phrase “ants in the pants” took on new meaning when Louis did not watch where he was stepping our last day in the jungle and parked himself on a leaf cutter anthill. Within seconds, ants were up his pants and in them, in his boots, under his shirt and on his neck. Being able to strip quickly in public while hopping from foot to foot turns out to be a key jungle survival skill. Never allow yourself to laugh so hard you miss the photo opp that may never come again. One defensible answer might be its introduction of well-ordered street grids, people-friendly central plazas and squares, dazzling churches and chapels, romantic balconies and and courtyards, and extravagant art to fill them. To our Western eyes, at least, these are lovely. What has been eye-opening for these same Western eyes is that much of this beauty is not actually Spanish or colonial at all, and that the handiwork itself often came from the hands of pre-Colombian peoples, not the interlopers. The street in the photo below is definitely colonial (minus the street lights and mural). We know that because the buildings have no windows, and that was the signature feature of a Spanish colonial home in the 1600s. But it was the Moors of North Africa who introduced arches, geometric design and shaded interior courtyards with splashing water to Spain and thus they who bequeathed arches, geometric ornamentation and leafy courtyards on New Spain. Other flourishes that strike us outsiders as “colonial” turn out to date from long after the colonial period. Cuenca’s iconic “new” cathedral was begun in 1885, designed by an Alsatian monk and not completed until 1975. The signature blue tiles of its domes were imported from Czechoslovakia and its exterior pink marble from Italy. Cuencans of the early 20th century also embraced French architecture with a passion, stamping a distinctive European feel on many streets that has nothing at all to do with the Spanish. Meanwhile, up north in Quito, the neo-Gothic Basilica del Voto Nacional would not look out of place in any medieval French market town except that its construction began in 1926 and its gargoyles are iguanas and armadillos. And, deep under the earth across the border in Zipaquira, Colombia, one of only three underground salt churches in the world was shaped not by the Spanish but by local salt miners in the 1950s on a site that had been mined since the 5th century by the pre-Columbia’s Muiscas. All the same, there also endure many decidedly colonial Spanish influences, and they can seem the stuff of fairy tales. It is hard to imagine a time when there was no such thing as UNESCO World Heritage sites yet it was only in 1978 that the international program began, and it is because of a Spanish church that Quito was the first city in the world given the UNESCO World Heritage seal of approval. The Jesuits were the last of four Catholic orders to evangelize what is now Ecuador. The crown said there was no land left in Quito for the late-comers so they would have to make do with converting the countryside. The order dutifully headed to the sticks. There, in the great tradition of don’t get mad get even, the brothers managed to become so rich they came back to Quito and bought up an entire city block. The next 160 years went to building Iglesia de la Compañia de Jesus, a baroque splendor gilded from floor through ceiling with 23-karat gold leaf and today filled with art, detail and the remains of a former president. Elsewhere, the founder of Tunja, Colombia, was a devotee of Mary mother of Jesus. In the 1570s, he financed a chapel in her honor within the exquisite Templo de Santo Domingo, now all but lost in a teeming university city of little other distinction. Suárez Rendón’s Capilla del Rosario is a wonder of carved wooden columns painted deep crimson and gold-plated with flowers. Elsewhere in the church, transporting frescoes are decidedly Spanish despite the occasional pre-Columbian godhead. Rendón and his fellow conquistador, Don Juan de Vargas, also left a trail of exotic wild animals and Greek mythology on their ceilings, the likes of which are found nowhere else in South America or maybe Spain itself. They even paved pathways in fossils. And then there are the haciendas, the estates of invaders who settled and farmed rather than mining and warring. Ecuador, which didn’t have much in the way of mineral wealth, is peppered with these grand houses brimming with history, some of them exquisitely restored. Hacienda La Cienega near Lasso is among the oldest in the country, built in the late 1500s and visited many times by Simón Bolívar in his campaign to liberate the region from Spain. The approach through an alley of eucalyptus (planty much later) is worthy of a lord, the gardens remain magnificent and the private chapel otherworldly. Hacienda Cusin north of Quito remained in the same family from 1602 until it was broken up in the 1960s during Ecuadorian land form. For a few decades, the estate fell derelict to bad ideas and neglect, but it has now been revived as a magical lodging for Quinteño weekenders and lucky foreign travelers like us. Lest we give the Spanish undue credit even for these legacies, it should be remembered that virtually all the construction and art attributed to them in the New World was actually produced not by Spaniards but by armies of indigenous artists, who were conscripted if not enslaved by the church and who were viewed as mere tools through whom God spoke, not as human artisans. They were not allowed to sign their works. And yet, these hundreds of years later, from the countrysides to the city centers, the art and architecture from earlier times continue to stun the eye and refresh the soul, immortalizing their creators one and all. One of the bonuses of traveling long-term the way Partout does is flexibility. Without being on much of a schedule, we can make make adjustments — adding, deleting or shortening stays — without big financial penalties and sometimes with budget windfalls. Back in the States, we eliminated the Galapagos from our Ecuador itinerary for a lot of reasons, one of them the expense of cruising. Once on the ground here, we found flights to the islands an eye-popping 40% to 50% what they cost from the States and cruises priced as little as half what comparable cruises cost from home. If you are traveling for a month or more to a destination and can stand the suspense of not having every room and transport nailed down, booking on the fly can be more economical and even spice things up with the unanticipated. Eureka! The Fountain of Youth! Remember the scene from Back to the Future where Marty McFly discovers he has been accidentally time-traveled back to 1955? In Vilcabamba, Ecuador, we joined him. We came to the 4,000-soul town so far south it is almost in Peru because there was this really enticing AirBnB cabin with great reviews, and it looked like a great place to do nothing for a week. Which it was. After one day of absolutely nothing, we were ready for something, so we trekked downhill an hour and a half from the cabin to the town itself. Which is where Marty McFly comes in. Picture this. . . . Location: Classic South-America pueblo. Inevitable Spanish-style church opening onto inevitable main square. Two-story buildings with balconies hanging over square, one-story adobes slouching down cobbled or dirt streets beyond. Except for the overhead wires and 4WD taxis, probably not much changed for a century. Back story: “Oh, Vilcabamba: where mountains soar alluringly above town, where the balmy air is synonymous with longevity (it shot to fame for its high number of centenarians after Reader’s Digest did stories on them in 1955), where those who encounter it simply get waylaid – sometimes for months, sometimes years. . . (Lonely Planet). Rough translation: “Live in Vilcabamba and live long.” Dapper Don here lived to 104. Casting: Superannuated hippies, some weathered to leather. Birkenstocks and beards, long beards. Dreadlocks and tie dye. Billowing harem pants, macrame purses. Young hippies come to grow old with the old, some with their own young or, at least, their dogs. Throwbacks to San Francisco in the’60s, Asia in the ’70s, Mexico even today. Yoga galore, reiki, heavenly massages at heavenly prices. And gringos. Lots and lots of gringos. Gringos sipping life-extending fruit drinks at the Juice Factory. Gringos drinking flat whites at UFO (“United Falafal Org.”) and Beverly Hills Café. Gringos everywhere else drinking beer. Gringos watching a classic avant garde Soviet propaganda film at an “underground” cinema that screens movies very much above ground on a white sheet. Hard to say whether Louis is happier about finally finding a screening of the classic Soy Cuba or because he see a movie out-of-doors in a T-shirt at night in winter. Gringos from the US and Canada, from Germany and Poland, from just about everywhere except Spain (the Spanish seem to have stopped coming to the New World) and China (so far). 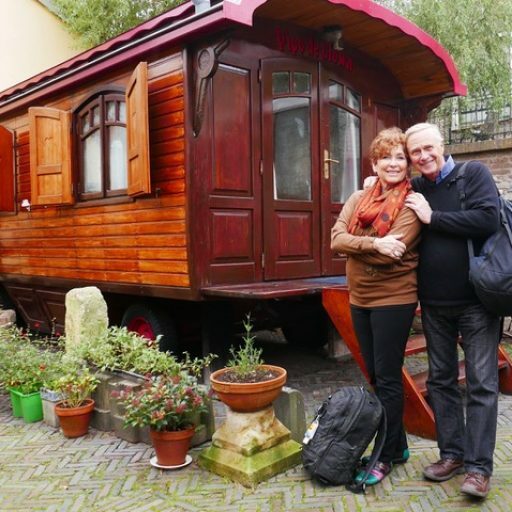 Gringos traveling on wheels that have rolled from afar. There once were even more gringos, we were told, not so long ago. In 2015, an asteroid was supposed to devastate the globe in September. Gringos reportedly flocked into Vilcabamba to dig bunkers to survive the impact and then flocked back out when they were not impacted. Even so, estimates are that about 30% of the village’s population is still foreign, drawn by the spectacular setting, mild climate, drinkable water, low cost of living, universal health care and, maybe, beer and flat whites. Every one of them has a story. The German who lives outside Vilcabamba but comes to town to go to a sweat lodge. The Londoner who came to South America for six months in 2010 and is still here, building houses for gringos. The former world-ranked tennis player-turned-Bay-Area-hairdresser with his jazz-singing wife. Others stay, for years or forever, the pre-pensioners opening bars and restaurants, providing services, practicing healing arts and, sometimes, all of the above and more. We picked up one business card that promised travel arrangements (airplane, hotel, transportation, car rental), payment services (electricity, water, taxes) and Spanish/English tutoring (both languages), all from one person. Us, we are now north of Quito for a long weekend before setting out in a canoe into the deep jungle. As always, thanks for sharing our road. Credit card mileage rewards feel like found money for us roadies. Since we would be charging purchases to credit cards anyway, getting free travel for spending money with them doubles the fun. The tricky part comes when we go to use the points to secure free tickets. More than once when we have gone online to ticket ourselves, the same ticket requires, say, 30,000 points from the first of us to go online but 45,000 points for the second. (Our points are in separate accounts to maximize sign-up bonuses.) We know it can’t be a matter of the first of us getting the last ticket available at the lower award level because it happens to us repeatedly – and because we have found away around it. This may sound like throwing salt over a shoulder to escape evil, but we now buy awards tickets sitting side by side on separate computers, logged on from separate email accounts and going through the booking process in tandem, right up to “Purchase.” Without fail, booking simultaneously instead of sequentially locks in the same award deal for us both. For those of you who pine for Partout to occasionally ditch the reportorial voice and dive into the down and dirty of how Doris and Louis survive living out of suitcases for months on end, this one’s for you: the sickening, the creepy and the refreshing. We traveled five months last winter without either of us having even a sniffle. This adventure has not been nearly as perfect, mostly for Doris, who developed a mysterious and icky case of chronic nausea about half-way through our four-day train trip. When it started, we assumed the ick was motion sickness (to which she is prone) but, more than a week after leaving the train, she was still waking up nauseated every day. Since morning sickness was not in the cards, she began googling possibilities like “nausea as a symptom of mosquito-borne disease” and other dire explanations. One morning in Cuenca, we went on a walking tour that coincided with shaman day in the central market. Catholicism put down roots in South America without completely squeezing out pre-Columbian beliefs and practices, including shamanism (“belief in an unseen world of gods, demons, and ancestral spirits responsive only to the shaman”). In Cuenca, on Fridays and Tuesdays, curanderos from the countryside take up position in the public market so customers can bring their ills to be cured. The process begins with the patient (many of them the children of worried parents) being beaten lightly all over with bundles of medicinal herbs. Next, a raw egg is rubbed all over the body to locate the unseen agent causing the problem. After this, the egg is broken so the shaman can identify the source of the problem. Satisfied, the curer spits on the customer to expel the source of infirmity. Voila (for lack of a translation). All better, though, ideally, the process requires three applications. Doris seriously considered giving it a try but was put off by the spitting part. A few days later, she was tempted again in Quito by a variation that started with the herbal beating but ended with a cup of tea made from the herbs. This sounded much more appealing, but we ran out of time. Until the next shaman, she soldiers on, self-treating with motion sickness pills she buys from local pharmacies for 20 cents each and mostly improved without the spit. Still, a drag. Also under the heading of “sickening” for some of our fur-loving friends: We did consume the obligatory guinea pig in Ecuador, a treat for which families keep dozens, even a hundred of the creatures, on hand at all time. Even Doris, whose pet history includes Elvis the guinea pig, found the critter tasty. Five earthquakes in eight weeks feels like a lot, even to Doris, who grew up in California. The last one was the biggest of either of our experiences: 7.5. While it was maybe a couple hundred miles away, it still seemed to go forever. Having arrived at our mountainside perch well after dark, Doris especially fretted about the possibility of our cabin being shaken off its slope into the void. Blessedly, earthquakes being what they are, everything was back to normal within two minutes, other than the bananas that were still swaying in the windless pre-dawn outside our door. Creepier was word that a Russian tourist was murdered by robbers walking with his wife from dinner to their hotel in Quito on the same night we were there before leaving on the train. We have been unable to learn exactly where or under what circumstances (e.g., whether the couple was wearing bling, flashing money, resisting demands for their valuables). Louis, who has ducked more bullets and bombs than some soldiers, tends to shrug off news like this; Doris, the fretter of the duo, gets creeped out. Not enough to stop traveling, mind you, but enough to be happy to say goodbye to big cities for a while. People sometimes ask how we manage to live together 24-7 for months on end without killing one another. In all honesty, it can be a challenge. You know all those annoying little (or not-so-little) habits your dear one has that you can escape at home? Escape is not so easy on the road. Our first resort is laughter. A lot of what seems annoying can be funny if we can stop being annoyed long enough to find the humor in one partner coming unglued over the surprise of paying $20 to print a boarding pass (?!?) or the other going into a frenzy about running late when his watch stopped telling time accurately weeks ago. The second resort is that tried-and-true parenting trick: time out. One or both of us will wander off in different directions for a few hours to return with a refreshed take on the world, including each other. Keeping company with others is also a great antidote for too-muchness and just plain fun and enlightening. While in Cuenca, we reached out through our house exchange site to two fellow sets of home exchangers, who both graciously met up with us for drinks, dinner and even a custom hike through the nearby national park. We are still savoring those memories. When none of these completely do the trick, we know it is time to put on the brakes, get off the road, put sightseeing on hold, take a deep breath, recenter. That is what we have been doing for the last five days in our hillside retreat. This is what the respite looks like, if you haven’t seen the pictures on Facebook. This is what the respite has done for Doris’s resting heart rate. Ultimately, that’s the best motto for living out of suitcases for months on end, maybe for even more. Making friends on the road turns out to be the travel trick that enriches. We went through Homeexchange.com to find friendly folks in Cuenca because we know home exchangers have common interests and tastes and these guys looked interesting. In Medellin, we found an expats meetup group. After our shaman walking tour, we went to lunch with a delightful young international couple. For all the occasional creepiness, the world is mostly a friendly place. The internet makes it surprisingly easy to connect with fellow travelers of all kinds if sharing the road makes it more enjoyable, even for the occasional hour. The day that began with the earthquake ended with this rainbow. Best reminder ever to stay calm and keep moving. Ecuador is about half the size of France, yet Partout is spending nearly six weeks rattling around in it. That means we are moving pretty slowly, sometimes glacially. Nowhere was that more true than on our 446 km train trip (276 miles) “luxury” train trip from Quito to Guayaquil. The one-way trip took four days, an average of about 70 miles a day. We could almost have walked faster since it was nearly all downhill. But everything is relative. When the Guayaquil-Quito rail link opened in 1908, its trains traveled at the equivalent of warp speed by cutting travel between the two most important commercial centers in the nation from days to 12 hours. Towns sprang up alongside the tracks, and telephone lines followed. Businesses opened. Highland producers were able move perishable goods to the lowlands and vice versa. Farmers and communities throve. Travelers reveled in high-speed travel. Alas, over time, the train came to seem as glacial as Partout. Freight and passenger travel dwindled and eventually evaporated. The rails, engines and coaches fell into disrepair; in some cities, people even built on top of old train tracks. Eventually, the only sections still in operation were the ones that foreign tourists rode – the famous “Avenue of Volcanoes” through the Andes and the infamous “devil’s nose,” where the route takes a vertical drop of more than 1500 feet on a sheer rock face. Enter former President Rafael Correa, a charismatic US-educated leftist who campaigned and governed Ecuador on a platform of reform. He vastly improved standards of living nationwide before reportedly succumbing to the temptations of power and money. Fortunately for train lovers everywhere, he restored the old Guayaquil-Quito line before fleeing the country to avoid being prosecuted for kidnapping a political opponent. (He remains in Belgium.) Except for the stretches where recent landslides have covered the tracks and we shifted to buses, these were the rails we rode. In another country, this story might end with the good fortune the train’s restoration has brought to glacial tourists like us and all the oohing and ahhing the trip inspired, but it doesn’t. Whether intended or unintended (we never quite figured that out), one of the consequences of the train’s resurrection has been nourishing some of Ecuador’s oldest cultures along with the tourists who ride the rails. An estimated 30% to 40% of Ecuador’s population is indigenous – people who never intermarried with the late-coming Europeans or Africans and who retain their traditional language, customs and culture. They are people like Miguel Andrango in Otavalo, one of the last weavers in Ecuador to make tapestries and rugs on pre-Colombian backstrap looms, and Baltazar Ushca, the last man in a centuries-old occupation of ice merchandising. Ushca still chips glacial ice out of slopes of Mt. Chimborazo and musters it to market by donkey, but it is now made into designer ice cream instead of being indispensable to cooling meat and fish like it once was. They are men like the last embosser in Cuenca, still making art as they learned from their fathers half a century ago. They are women selling live chickens in the open markets, the ancient who could speak to us only in her native Quichua (not Spanish) and the cowherd making the daily trek with his two milk cows up and down pre-Incan paths high in the Andes. They are communities like Palacio Real, a village of about 80 households. Women there have organized an association that operates a restaurant where they serve delicious local food cooked over wood fires and operate a tiny shop where they sell exquisite goods woven from the wool they have sheared, dyed, spun and woven from the llamas they raise. When clothing items are sold, 50% of the price goes to the woman who produced them and 50% is reinvested in the association projects, like their museum of llama culture. Our train stopped in the nearest station, and we walked half an hour to visit them. The goat stew and bounty of vegetables were delicious; the shopping time not nearly long enough! Christine in the lower left knit the scarf she holds. Doris supported the community by buying it. They are individuals from subsistence cultures that benefit from TrenEcuador’s employment of them to demonstrate their dances and serve their foods to the likes of us. The dances on board by masked devils have their origins in indigenous protests against Spanish occupation.Treats like ceviche of chocos and folkloric dancing were served at the stations. They are also people like Christian, our local guide at Sibambe. In excellent English, Christian demonstrated the conch shell his community has used for 200 years to call citizens to meetings and emergencies. Before the Spanish, conch shells were currency, and they still are valued today. He explained that the beds villagers sleep in above pens for guinea pigs and rabbits are designed both to protect the stock and to warm the humans overhead. He showed us cooking pots in use every day that look just like the ones in the anthropological exhibits of the Pumapongo museum in Cuenca. Christian’s American wife was not interested in the life of an indigenous Ecuadorian. Now he stays in touch with his 5-year-old son by Facetime. Christian lived in the United States from the time he was 14 until he was 28, moving around the country as he worked his way up in the construction trades. He married an American woman and had a son. Then he was stopped for a traffic violation, found to be in the States illegally and deported. He returned home to his Andean village of 2,500, where he tells train passengers like us about local traditions before hiking the hour and a half over a peak back to his village. TrenEcuador helps sustain him now, too. It is not all one big happy welcoming party on the rails. Indigenous communities around Guamote once banned outsiders from their Thursday markets, where inhabitants of different villages have converged for centuries to socialize, buy what they cannot grow in their own communities and indulge in local delicacies. Now they tolerate passengers from TrenEcuador wandering among them, admiring their produce and snapping photographs. Louis was in street photographer heaven. One of the richer countries in South America because of its resources and self-sufficiency, Ecuador is undergoing the urbanization common to developing countries everywhere. Traditional cultures that have been under pressure ever since the Incas arrived shortly before the Spanish are experiencing new challenges as youth brought up on Netflix and YouTube reject rural life and eschew ancient practices. Some ethnic groups survive only in pockets of a few hundred or few thousand people. But survive they do. For some, the resurrected train through the Andes is one of the survival strategies. One of the best – sometimes the only – way to get off the beaten path (or to do a deeper dive into the beaten path) is with tours and/or knowledgable guides. No matter how much we read or study, we can’t duplicate their depth. Our TrenEcuador excursion proved this point, but we usually are happy with more modest sources. We Google “free walking tours” as soon as we hit each new city and choose the top-rated one. They can be hit and miss (they are, after all, “free”), but they never miss entirely; even the mediocre ones orient us to getting around and provide some background. AirBnB has added “experiences” in some cities that provide out-of-the-box insights (that’s how we found our “violence to transformation” day tour in Medellin), and GetYourGuide is a personal favorite for the quality of their paid tours. We found a guide to the Incan ruins of Ecuador by walking into a local travel agency. Always, Doris scours traveler forums for the names and contact info for guides others have found superlative. TOP TIP: If there is any sight, culture or experience you really want to see that is under environmental, political or social challenge, go while going is still an option, however you do it.